If you’re the proud owner of a thriving education business, you may have considered franchising as a viable method for replicating your business success in other locations. Franchising can be a great model for growth, but it’s important to ensure that your business meets the necessary requirements before taking the plunge. This article will discuss the benefits of franchising, the requirements that should be met before opting for this model, and how Teachworks’ master account feature can help with this transition. Franchising is a capital-light model that allows you to grow as quickly as you can find capable franchisees. Since franchisees invest their own capital to open a new franchise location, you won’t have to invest your own. In addition to capital, the franchisee also brings a wealth of knowledge to the table. Their local knowledge can help you expand into markets that are unfamiliar to you and the chances of success are much higher as a result. Franchisees have more to lose if their franchise fails, and because of this they are generally more motivated and determined than regular employees. With a franchising model, your business faces less financial risk. There isn’t a need to borrow money to open new locations because franchisees provide the capital for their locations. 2. What Makes a Business Franchisable? Return on investment – Investors generally look for at least 15% return on their investment (after expenses). Business risk – Investors are more likely to invest if you have a proven track record that spans over a few years. Growth potential – There needs to be an increasing demand for your service in their location. Support system – Support systems need to be in place to help the franchisee operate their business more successfully. Potential franchisees have many investment options available to them. In order to pique their interest, it’s essential to provide them with a superior alternative. Your business should be profitable, but it also needs to offer a good return on investment. In addition to a good ROI, it’s also important that your profits are relatively stable over the past few year. Potential franchisees will be hesitant to invest if there is too much fluctuation from one year to another. It’s important that your business model can be replicated in different markets with the same level of success. Having a proven track record that illustrates how effective your business model is will make it much more appealing to potential franchisees. The key factor in making a business model repeatable is standardization as this ensures that each location follows the same processes and procedures. While franchising is less capital-intensive than other ways of expanding your business, you’ll still need to invest a significant amount of capital before approaching potential franchisees. Things like market analysis, legal fees, marketing materials, advertising costs, training and additional staff can quickly increase the budget, so be sure to prepare thoroughly. Operating a successful franchise system requires a certain type of personality. You need to be able to entrust others with the operation of their location. It’s also important that you are committed to building long-term relationships as this is essential in running a successful franchise system. If you plan to franchise down the line, it’s important to choose tutoring management software that’s able to support a franchise model. Teachworks offers a master account feature that allows you to effectively manage your franchise locations from a single account. You can view consolidated results, add & manage locations, and seamlessly switch between locations. Standardization ensures efficiency and consistency in each franchise location. 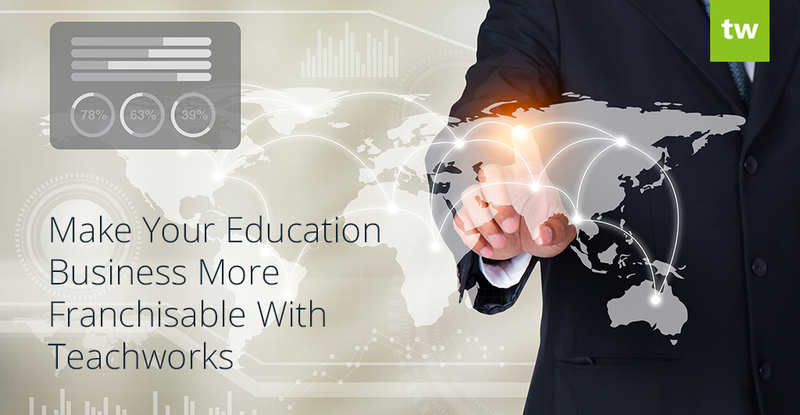 Using Teachworks as the management system for all locations can help you to ensure that each location is able to operate using the same processes. Our master account feature lets you save default account settings that can quickly be applied to new accounts that you add. If your business is expanding rapidly and you’re adding new franchise locations regularly, this feature will speed up the admin process and ensure uniformity. A master account allows you to seamlessly switch between franchise locations to view or manage records and settings. A master account allows you to view charts, graphs and list results to monitor key performance measures such as lesson counts and hours, revenue and more on a consolidated basis or by franchise location. Ready for more? Download our free ebook for more in-depth information about what franchising is, how it can benefit your business and how to attract franchise investors. You’ll also find more information about the 5 Franchise Criteria that a business must meet in order to become a successful franchise. « Streamlined Attendance Taking and Other New Updates!